Silver Surfer tricking off of Galactus' head is cool but, come on, Bobby Drake is the gold medalist of doing cool stuff in/with cold weather, right? 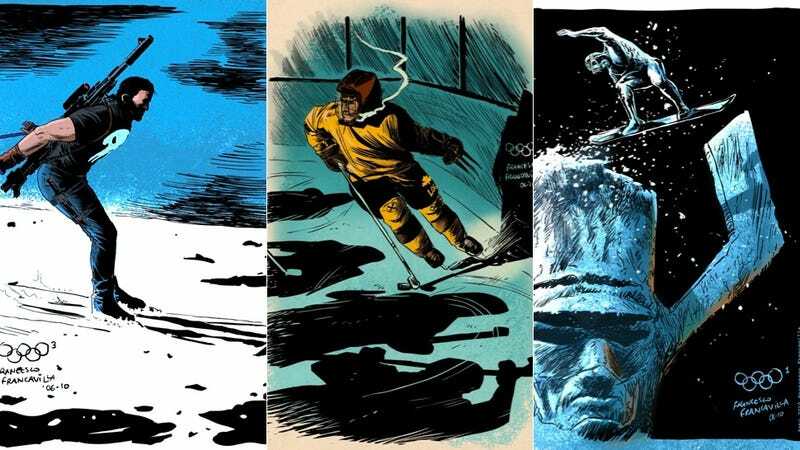 These drawings comes from superstar comics artist Francesco Francavilla, who's doing that gruesome Afterlife with Archie series and the excellent superhero pulp noir The Black Beetle among others. He'll be unveiling a new picture on his Tumblr every day of the Sochi Olympics so one hopes that he'll get to the X-Men's resident cryokinetic sooner or later.